NTT DATA, a global IT services provider, announced today that it has selected Barcelona-based startup Gestoos as the Champion of the Open Innovation Contest 7.0 based on its AI solution that enables content and services to be operated simply with hand gestures. The winning proposal was chosen during the contest’s Grand Finale at NTT DATA headquarters in Toyosu, Tokyo on March 22. NTT DATA will collaborate with Gestoos to develop a concrete business plan based on the winning proposal. The global competition, which is organized annually by NTT DATA, invites high-tech companies worldwide to submit proposals for IT services that offer potential to create new value in global society. The judging panel includes both NTT DATA personnel and outside experts. The Gestoos AI solution recognizes and interprets subtle physical movements to enable people to operate content and services with just hand gestures. Gestoos’ patented proprietary algorithm uses live data to learn about interactions involving people, objects, spaces and vehicles. The entry was selected as the best idea for a previously unimagined IT service with high value-creation potential for public bodies, private companies and individuals, all customers of NTT DATA. NTT DATA received 269 applications from around the world starting last December. Between December 6, 2017 and March 2, 2018, regional contests were held across four continents in 15 cities of 14 countries, up from 10 cities of 9 countries last year. Each of the 15 regional contests selected a winner to present a proposal during the Grand Finale in Tokyo. The proposals covered fields such as fintech, medtech, insurtech, security, artificial intelligence (AI), augmented reality, authentication, AI-supported optical character recognition and navigation. In addition to the winning prize, an Audience Award was presented to ftcash (Mumbai) and Judges Awards were presented to FOMO Pay (Singapore) and SightCall (San Francisco) by NTT DATA representatives on the judging panel. NTT DATA’s open innovation initiatives have led to the creation of numerous new businesses already. Together with Social Coin, last year’s winner, NTT DATA recently established the “Regional Issue Discovery Lab” to apply AI technology toward innovative solutions that address regional issues. Each regional contest this year was organized in collaboration with NTT DATA group companies and regional partners: NTT DATA UK and Innovate Finance (UK), everis (Spain, Brazil, Portugal and Chile), MaRS Discovery District (Canada), Institute of Software, Chinese Academy of Sciences (China), NTT DATA Inc. and Runway (U.S.), Deloitte Israel (Israel), Startupbootcamp and Rainmaking Innovation (Singapore, Australia and India) and Asian Payment Network (Singapore). 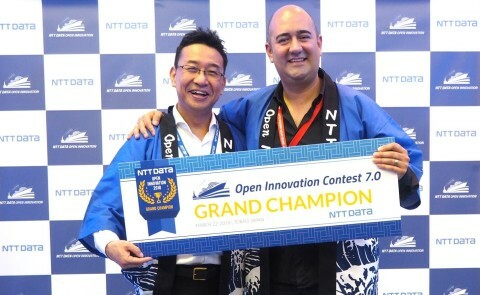 NTT DATA will hold the Open Innovation Contest in worldwide venues again next year. NTT DATA is confident that the contests are winning propositions for the participating startup companies as well as NTT DATA, client companies of NTT DATA, and global society. For more about the contestants: http://oi.nttdata.com/en/contest/result. The following contestants presented at the Grand finale. An asterisk (*) indicates inaugural participation in the contest.